The Village School, a private school for gifted children, has now expanded to 1,750 students, outgrowing their space several times. With a wide variety of programs and a long history, the school needed a way to display a great deal of information. They were specifically looking for an engaging way to celebrate the academic and athletic achievements of their students as well as demonstrate the school’s advantages to prospective families and visitors. The school invested in a four-screen video wall and three Digital Trophy Cases for their new athletics building and admissions office. Additionally, the middle and elementary schools each have a large screen featuring admissions and event information. 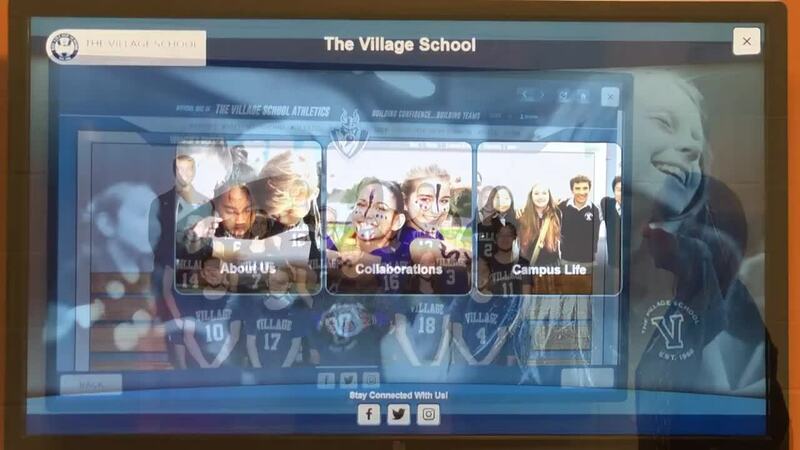 The Digital Trophy Cases allow administrators to display an endless amount of information about the school, including sports, academics, student experiences, and sponsors. The interactive screens enable users to easily navigate through the pages they wish to learn more about. Our software platform not only enables real-time access and updates but also allows different privileges for different users. This is important for both the Athletic and Admissions teams to keep the content current and exciting. Coupled with their video wall, the screens provide a fun view for students and parents alike, while allowing the school to present and inform more effectively than before. The Village School has taken the opportunity to use this medium as a creative outlet within the school. “We've also loved the ability to highlight athletes in an artistic way in our halls, they really love having that coverage and it makes it manageable for us,” explains Rachel Sloan, the school’s Marketing Coordinator. The Marketing team has produced content for their Digital Trophy Case and video wall which includes aerial footage of their campus and media discussing student involvement. Until recently, this information could only be found on their website. This modern approach allows the school to update experiences in real-time without worrying about room for future achievements, all while keeping alumni, visitors, families, and students informed and engaged. “Digital Trophy Case has provided a great way for families who are entering events or waiting for events to use that time in an educational manner. Not only can they learn about the school history and records but about our unique approaches as well,” Sloan states. Check out their Digital Trophy Cases and video wall below!